It is no secret that I LOVE Gel printing with my Gelli Arts® gel printing plate and one of my favorite things to do is to teach Gel printing classes and get other people excited and fall in love with their Gel plate too! As with most things, to become an experienced Gel printer you have to PLAY, EXPERIMENT and PRACTISE! Over and over and over again. To get to know your Gel plate, learn how certain techniques work and get an idea of what you can expect, you HAVE to get your plate out and use it! A lot of times my students tell me they have a Gel plate, tried it once or twice and were not overly excited with the results. But hey, what can you expect after only a couple of attempts? So, I decided to challenge you! I made a list of 31 prompts (find the list below), going from techniques or products to use, to color combinations and shapes. During the month of March, I will post (on my Instagram feed) a Gel print created with these prompts every day and I hope you will join me. I know, for sure, that after those 31 days, you will love your Gel plate as much as I do. Because, as in every relationship, you have to work for it, commit to it and also accept that it might not, nor has too, always be perfect. Already a gel printing expert? Then please join too! I would love to see what you create and you might get some new ideas or step out of your comfort zone along the way! At the end of the challenge I will randomly pick 2 people who played along and used these hashtags and send them one of my new Art Printing designs from Carabelle Studio! So what are you waiting for? Dust off your Gel plate and permit yourself to FALL IN LOVE!! 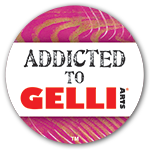 As you might know I am doing a monthly video for Gelli Arts®. Some of them might be helpful with some of the prompts. On the concerned day I will refer to the appropriate video but you will also find all my videos HERE! I hope to see you on the 1st of March!